Why Does Olympic Flag Have 5 Rings? I surprised Smarty by telling her that the famous Olympic symbol of the modern Olympic Games was designed to represent populated continents of the world. She was instantly confused, Well, I see that Antarctica would not be there, but why 5 rings and not 6? It was funny to see Smarty really wrapping her mind around the concept that some things that we consider to be "true", because we learn them practically in kindergarten, are just agreed upon "conventions". In fact, the number of continents is not even universally agreed upon constant. I, for example, grew up with 6 continents model where North America and South America were considered one continent of Americas. Yes, we also had catchy continent song in my native Russian, just with one continent less than here in the United States. However, since 6 continent model was more prevalent in Europe in the early 20th century, founder of the modern Olympic Games Pierre de Coubertin designed an Olympic flag with 5 interlocked rings and not with 6. Does Each Ring Represent a Certain Continent? Blue is for Australia, because it's surrounded by water. 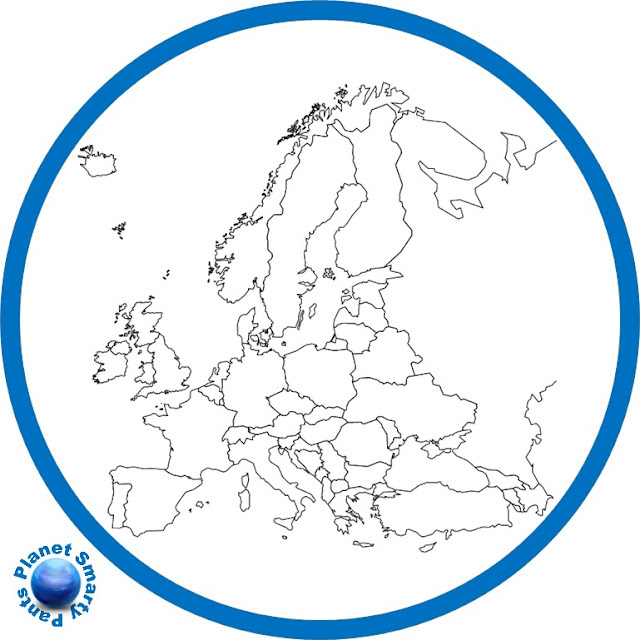 Black is for Europe, because it's in the center and that's where the Olympic Games started. Red is for Asia, because Chinese lucky color is red. Yellow is for Africa, because of Sahara desert. Green is for America, because we have a lot of National Parks. As you can see, she managed to "logically" reassign every color away from its canonical meaning. Speaking of canonical meaning, as it turns out, Pierre de Coubertin did not assign continents to colors, even though it was part of "Olympic lore" in the 20th century. In fact, he chose these colors, because when combined with the white background, they represented the colors of the flags of all nations at that time, without exception. Live and learn! Still, even though colors of Olympic rings do not match continents, it can be fun to use them that way for learning games. 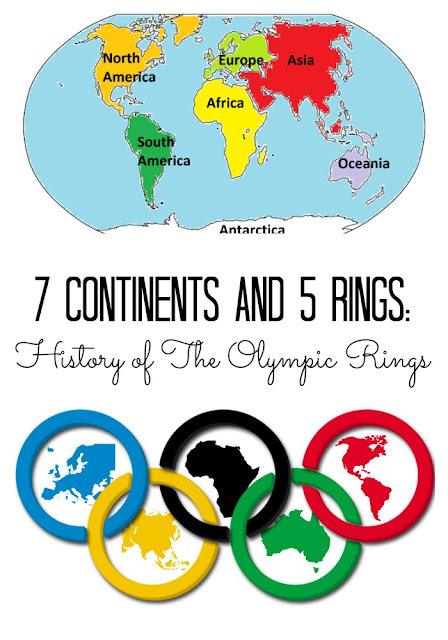 This is why I put together a free printable of 5 Olympic rings and 5 continents. I will share how we use this printable in my next post. 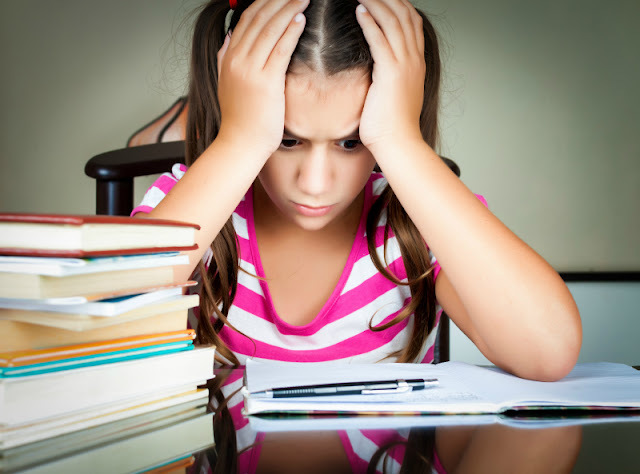 How often do you wonder if what you learned in school is still true? Check out these ideas from Early Elementary Blogging Team! More Geography Ideas for Kids? I can argue that we only have one continent on earth; it's just broken up into smaller pieces. There is a pretty good argument for the Americas to be only one continent. There's a great mini-series called something like the First Modern Olympics, and it's pretty interesting. It follows 3 or 4 story lines (I haven't watched it for almost 4 years). The American team, the Greek team, the British team (I think, or maybe it was Australia), and the founder of the Olympics. I need to see if I can dig up the exact name. If you grew up in the Hispanic World (Central or South America), you learn that there are 5 continents. America, Africa,Australia, Asia and Europe. Antartica is not onsider a continent because no one lives there indefinitely. Only tourist ans scientists spend some time there. The five colored rings were selected because one or more of these colors appears on every flag around the world. They are all linked together, symbolising unity amongst all nations. google docs is not allowing me to access the rings with the continents, love to use it with my kids. Wrong. It's been generally agreed that there are 7 continents since the 16th century and Magellan. 7 was always a sacred number, e.g. 7 Classical Planets, 7 days in each of the 4 lunar phases gave us 7-day-week, 7 stars in Orion/Big Dipper/Little Dipper/Plaiedes, 7 Seas, 7 Wonders, #7 is a recurring theme in the Bible. 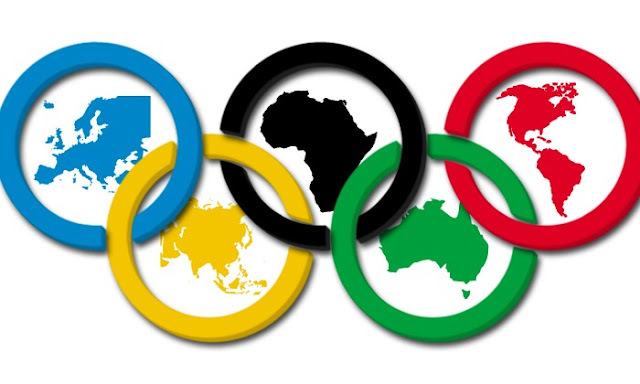 The Olympic Flag represents the 5 continents from which competitors come with Australia included with Asia. North and South America is one hemisphere, but has always been considered two continents. Last summer (2016), it was repetitively said, "With the Olympics in Rio, it's the 1st time they've been held on the South American continent."